The fuchsia plant (Fuchsia spp.) is known for its unusual, often bicolor flowers that cascade from the plant in large numbers. Often grown in a hanging basket as an annual, fuchsia can also grow outdoors year-round in U.S. Department of Agriculture plant hardiness zones 10 through 11. Although this plant is usually trouble-free, occasionally its leaves might start turning yellow, which could indicate a problem that needs to be corrected to prevent further damage. Fuchsia leaves turn yellow and drop from the plant as part of its natural growth cycle. This is especially true of leaves near the bottom of the plant. When a fuchsia grows outdoors year-round in warmer regions, its older stems become woody and it develops into a shrubby plant. Leaves near the plant's base gradually age and might turn yellow before they fall. Remove dropped leaves regularly to keep the area tidy and to prevent growth of fungus in the decaying fallen leaves. Improper watering or other problems, such as too much sun, might also cause leaves on a fuchsia to turn yellow. Either under- or overwatering could cause fuchsia leaves to turn yellow. When the soil stays dry and the plant doesn't get enough water, the leaves can't carry out photosynthesis, and start to lose their green color and turn yellow. You'll probably also see general wilting of the plant. Watering corrects this problem if you catch it before the plant dies back completely. If the fuchsia gets too much water, this also prevents photosynthesis because the roots can't take up oxygen from the overly wet soil, so the leaves turn yellow. If the soil feels soggy, let the plant dry out slightly before watering again. 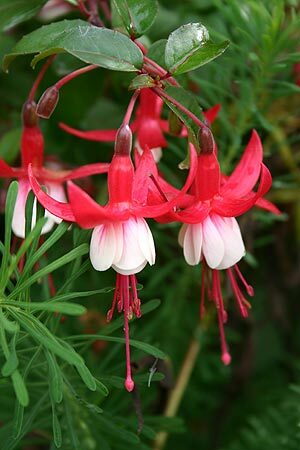 For best results, water a fuchsia whenever the top of the soil feels dry to the touch. If you grow it in a pot, always let the soil drain freely and never keep the pot in a water-filled saucer. If your area has hard water -- high in minerals, especially lime -- this could also cause yellowing of leaves. You can fix this problem by using purified bottled water for the plant. A fuchsia plant grows best outdoors in partial shade, and needs protection from the hot afternoon sun. When grown indoors, indirect light such as near a west- or south-facing window is best. Too much sun can cause sun scorch, which burns leaf edges and, if uncorrected, can cause entire leaves to turn yellow. This can also happen if you wet foliage when watering in summer, because the sun heats the water while it's drying. Move the plant to a shadier spot or adjust your watering schedule to correct this. If your fuchsia is an older plant that's been in its pot or in the same garden spot for several years, its lower leaves might turn pale yellow because the soil's magnesium supply is low. Correct this by adding 1 ounce of Epsom salts to 1 gallon of water and using this to water the plant two or three times. A fuchsia is susceptible to several fungal disorders that could cause yellow leaves. A problem called rust produces yellowish or orange pustules, or masses of yellow fungal spores, especially on leaf undersides, with the upper surfaces also turning yellow or brown. Another fungal disease called Verticillium wilt <ahref="http: www.ipm.ucdavis.edu="" pmg="" garden="" plants="" diseases="" vertwilt.html"=""> </ahref="http:>can turn leaves light green, then yellow and brown. New shoots also die back and entire stems might be leafless and die. Prevent fungal problems by watering plants at the base to keep foliage dry. If you see one of these fungal problems on a stem or two, trim off that part, cutting into healthy tissue behind the infected area and wiping your blades with rubbing alcohol between each cut to prevent spreading disease. Several viral diseases can also afflict a fuchsia, causing yellow mottling or circular, yellow to brown spots on leaves. There's no cure or treatment for viral diseases so it's best to discard an infected fuchsia plant. Always choose plants certified as virus-free at nurseries or garden centers.